This plug-in allows to export photos from Adobe Lightroom to CVS Photo Center (www.cvsphoto.com). The number of photos in a single album is limited to 10. 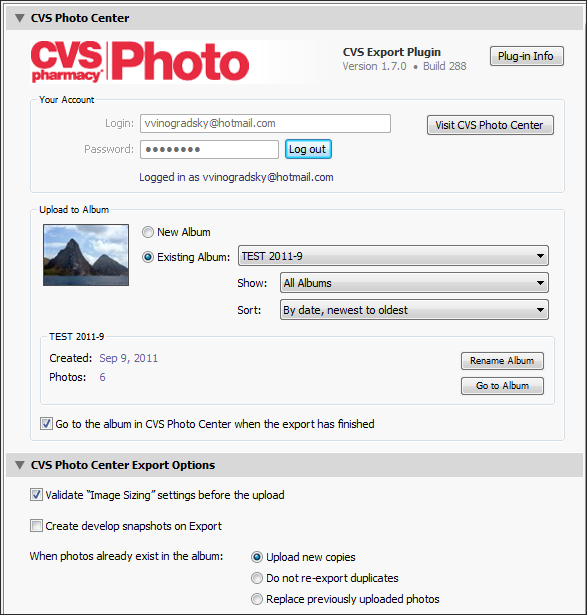 The CVS Photo Center Export Options section is unavailable (grayed out). Compatibility fixes after recent changes at the CVS backend. Added support for Lightroom 7. Migrated the plugin to the new backend API. The plugin now implements a fully featured Publish Service. Publish Service: Now you can associate previously uploaded online photos with photos in Lightroom catalog. Reclaim Photos. Now you can download your photos from CVS Photo to your computer and rebuild your publish service. Available to registered users only. Added the ability to edit album descriptions. Export Dialog: created album disappears from the album list until manually reloaded. Album caching algorithm: minor improvements. Compatibility fixes after a recent change at the CVS backend. Export Dialog: new Quick Filter enables you to search albums using a text string. Implemented "POODLE" (SSL Vulnerability) detection and remediation. Improved session management and error handling. Improved the Automatic Update feature. Fixed the authentication sequence after a recent change at CVS backend. IMproved handling of large uploads. Added the ability to upload photos in their original format (without applying any conversion or resizing), provided the photos are already in JPEG format. Added a "Visit Album" button for opening selected albums in the web browser. Added a "Album URL" field to the CVS Metadata set. Fixed authentication issues after the recent changes at CVS's back-end. Code refactoring amd improved handling of connection related errors. The photo URL in CVS Metadata now generates correctly. The album URL in CVS Metadata now generates correctly. Export Dialog: Removed the unused "video" section. Remove the CVSExport.lrdevplugin folder, then install the update using the new installation packages. Now the plug-in handles unsuccessful authentication correctly. Renaming albums now works correctly. The Check for Updates dialog now offers two options: "Apply the Update" and "Visit Download Page" in case you prefer installing the update manually. The Submit Debug Log screen now reminds the users to make sure they are running the latest version of the plug-in. Fixed a couple of cosmetic issues with the Export screen. NOTE: Starting with version 1.7, the plug-in now requires a registration fee of $10 to help offset the cost of continuous development and support. Added the option to handle collisions between duplicate photo uploads. The user is no longer required to re-authenticate on a subsequent export. Improved the internal diagnostic of Internet connection related issues. Improved the layout of the Export dialog. Noe the selected album can be opened in the web browser with a single click. Fixed another issue with creating new albums caused by CVS modifying the back-end (again!). Now you can use the Enter key to start a new line in the Submit Debug Log window. Now the plug-in automatically validates Image Sizing settings. The plug-in will issue a warning if the dimensions of rendered photos are outside of the 'reasonable' 500 - 10000 pixels range. Photos that failed to upload are now displayed in a list box with the ability to save file names to a text file. A quick-fix for the issue with logging in when there are no albums in the account. Added the ability to submit the debug log to alloyphoto directly from the plug-in. The plug-in is now compatible with Lightroom 3.2 Release Candidate, Windows and Mac OS. Fixed some cosmetic issues with Mac OS. Fixed the issue with uploads meant for an existing album going into a new album instead. Implemented the option for automatic checking for plug-in updates. The option can be found in Lightroom Plug-in Manager in the Plug-in Info section. Fixed the issues with uploading photos caused by CVS modifying the upload mechanism. using windows XP and lightroom 2.3, there is no Modules subdirectory, so I created one and dumpe it all in there, not sure if it will work. will let you know? Cool plug in, I use Paint Shop pro (Corel) and they have a CVS hook, but a bit clunky.